Here is another DIY I did for Mother’s Day. 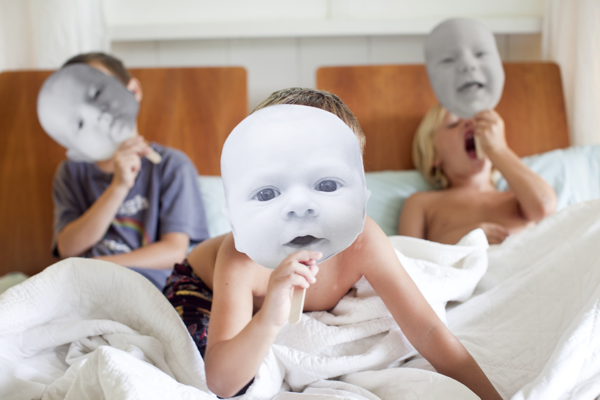 Surprise mom with some familiar faces on Mother’s Day with these baby masks. 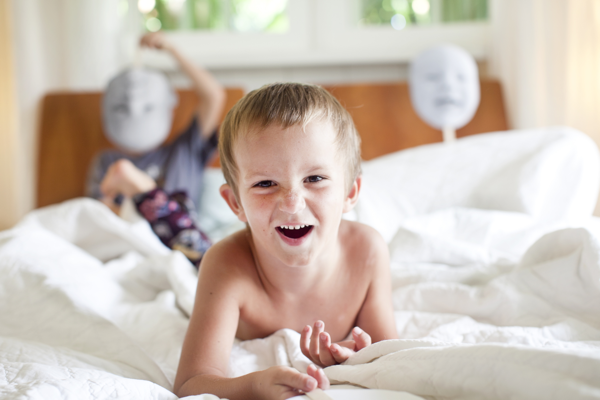 Chances are she’ll remember the faces that she spent so many hours awake with in the middle of the night! Kids will love this project and it’s really easy to do. See the instructions below! (A special thanks to the fantastic Hawaii-based photographer Natalie Norton for the photos.) The adorable pancake toppers are from Pretty Swell. Step 1. Get a baby photo where the whole head is showing straight on. Blow it up in either a software program like photoshop or take them to a copy machine and enlarge them. Print them onto cardstock. Step 2. 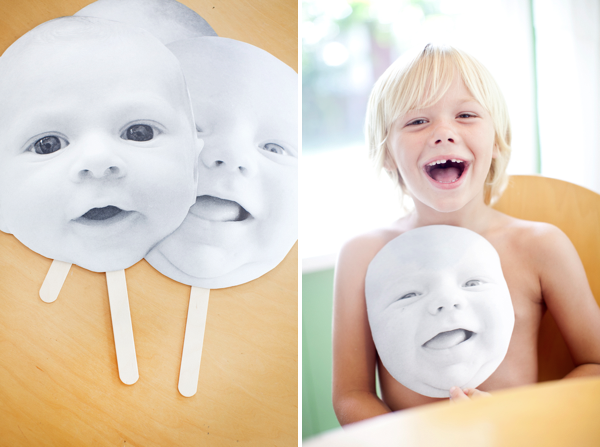 Cut out the faces and glue it onto a wooden popsicle stick. Step 3. Voila! 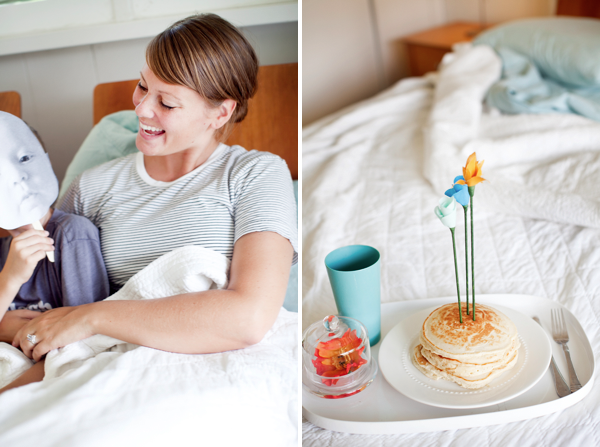 Surprise mom with breakfast in bed wearing your baby face! I want to do this! Thanks for sharing. Very cute idea! I might print in color though the black & white kinda freaks me out. Am I the only one? This is awesome. I'm totally doing this! 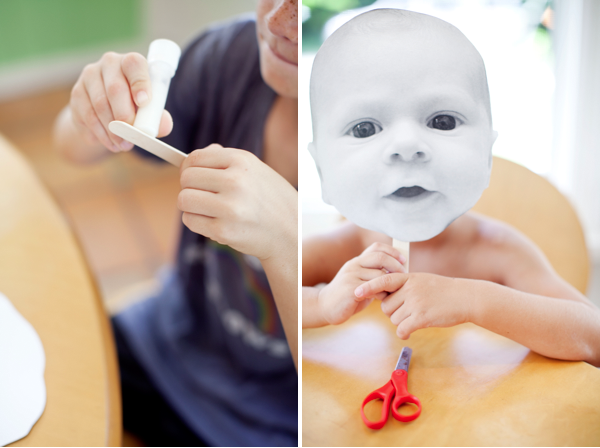 Big baby heads on sticks is so funny. hahaha My mom will love this. Haha am I the only one who thinks this is kind of creepy? The masks remind me of the movie Brazil and all it's attendant creepiness. i think it's both creepy and AWESOME! i love it and am going to do this tonight for a friend's birthday party. i hope i get it all done in time and my printer is cordial with me. thanks for the idea! Aw, I say it's cute!! Those are my adorable grandsons! Love this idea — very fun and clever! i just came across your blog and love it! Full of great ideas, inspirations and your life in Paris, spending the whole day with the ones you love, must be absolutely great. i recognize the lovely model portraying the lovely mother…good job erin! there is nothing better than a floating baby head!! adorable on all counts. natalie's photography is amazing too. Creepy awesome! I love it. I'm so scared right now! Oh my goodness those are so fun…and a little scary! Thanks for sharing! That is a hysterical and great idea!! How fun. Wonderful photography too..
A bit creepy, but the idea is cute! This is so fun! And that girl in the striped shirt is so pretty! LOL I was going to do this for my boyfriends surprise birthday party where all the guests wore a mask of his face…but then we never had a party for him haha Oh well…love the idea though. So terrifying! Who knew babies could chill the blood? No, not creepy! My husband did this with my kids on Sunday. I came out of the bathroom to find all three in my bed with the pics in front of their faces. It was freaking hilarious! I could not stop laughing, and then they couldn't stop. He also had them each write a sweet note on the back. Best Mother's day surprise EVER!! Do it for your husbands for fathers day! OMGosh, LOVE these! ha ha…. I like so much the photographs. Though they are maybe a little bit bright.